You want to make all that candy from Halloween last as long as possible. But just how long can you keep Halloween candy? Does candy expire? Best Food Facts reached out to Fadi Aramouni, Ph.D., professor of food science, Kansas State University, to find out the shelf life of Halloween candy. “If there are safety concerns with candy, it’s usually a quality issue, not an issue of expiration date,” Dr. Aramouni said. That’s great news for parents who want to ration out their kids’ candy so they don’t eat it all at once. (It’s also good news for parents who keep a few chocolate bars for themselves – like 72 percent of us do.) The shelf life of candy is affected by the amount of moisture and fat it contains, he explained. “Generally, it is very difficult for candy to spoil, due to its low moisture content, but it depends on the candy. For things like hard candy and chewing gum, there really isn’t much to worry about,” Dr. Aramouni said. He recommends following the guidelines from the National Confectioners Association on how long to keep various types of candy. Dark Chocolate: One to two years if wrapped in foil and stored in a cool, dark and dry place. Hard Candy (lollipops and butterscotch candies): Up to one year when stored at room temperature or in cool, dry conditions. Candy Corn: About nine months while sealed and approximately three to six months after the package has been opened. Jellied candies: Up to one year unopened. After opening, keep in a covered candy dish six to nine months. Gum: Six to nine months, as long as the packaging is sealed. Caramel: Six to nine months when stored at room temperature and away from the heat and light. Knowing how long candy lasts is helpful because there are many good reasons to keep back some candy and ration the treats over the next few weeks. “Candy is full of empty calories, and people need to eat candy in moderation. We are also concerned about the effects of the sugar related to the development of cavities. If people eat one or two pieces of candy per day, it would be OK. But any more than that causes concern,” Dr. Aramouni said. 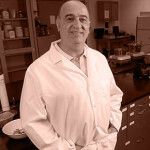 As a parent and food science expert, Dr. Armouni shares how he handles the candy question with his children. “My kids are limited to one or two pieces per day. If kids eat too much candy, the sugar will make them feel full, and the glucose level can affect satiety. More than anything, kids need to eat nutritious foods,” he said. He’ll also be giving candy to trick-or-treaters. “We will be handing out fun-sized chocolate bars – the kind with wafers,” he said. Halloween candy will keep for many months. To preserve the freshness, store it unopened in a cool dark place, such as a pantry or basement. Just because your kids got a lot of candy doesn’t mean they have to eat it. “And remember, it is OK to throw away old candy. Don’t feel compelled to eat it – it’s mostly empty calories, after all,” Dr. Aramouni said.